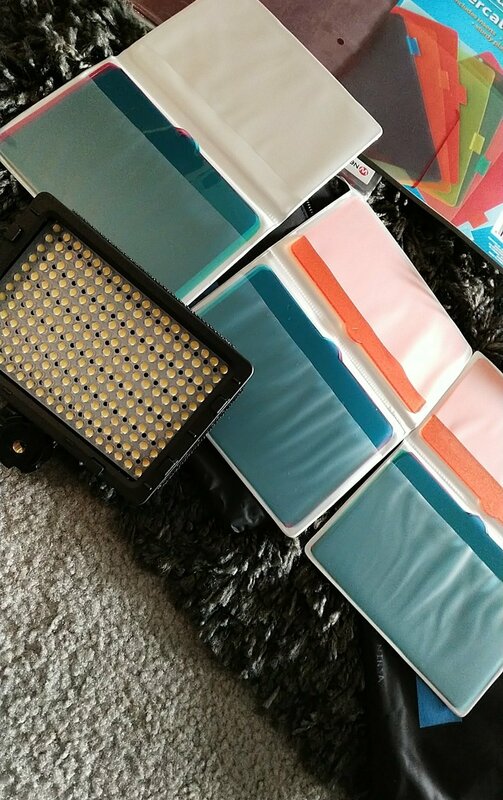 My Neewer CN-216 Lights came with two filters, a clear diffuser and a warming, Amber one. They are great for changing the color temperature, but not at helping add any style or setting a particular mood. After watching a YouTuber, I went to my local Dollar store and looked for some plastic folders or dividers that might work. They had some lighter weight cellophane wrapping paper, but I wanted something a little thicker. In the school/office supply section, I found what I was looking for; 8 different colors!!! If you are going to do this project this is all you will need: Plastic Dividers, Scissors, a Marker-Pen, and your LED filter so you can outline/stencil it. I was able to make 3 gels from one folder. I laid down the Amber filter and traced it 3 times. I kept the scraps and was able to make an additional gel for an old Canon Camera Light. After I cut them out, I checked them in the light to make sure the size and fit we're good. I did this for each of them to makes sure they weren't buckling and slid in really easy. They look pretty good. They are a little thin though. They add a subtle hue, versus, a deep or rich color. What I found is if you double up the light blue with the blue, or light pink with red, you get some really nice color. They make more expensive, thicker ones and even light corrective ones. Those run like $80!!! For $3 and an hour and a half, these will add a little versatility to your LED light kit.